(3) 2016 ABB Type R-MAG Vacuum Circuit Breakers SO MB30160ZZMH5KBL421 w/ 38.0kV Max Voltage, 1200 Amp Continuous Current, 60Hz, 1.0kV Range Factor “K”, 200kV Rated Lightning Impulse Withstand Voltage. (2) 2016 Schneider Electric “Power-Sub” Vacuum Substation Circuit Breakers w/ 15.5kV RMS Max Voltage, 60 Cycles, Full Wave BIL 110kV PK, 1 Min Withstand, 50kV RMS, 85ms Closing Time, Close &amp; Latch 108kV PK. (2) 2016 ABB Type 145PM40-12C “SF6 Power Circuit Breaker” BOM VEP12792-10 s/n VEP12792-01, BOM VEP12793-10 s/n VEP12793-01 w/ 145kV Max Voltage, 40kA Short Circuit Current, 1200A Continuous Current, 1.0 Voltage Rage Factor “K”, Short Circuit Closing & Latching Peak Current 104kA, Closing Time less than 4.5 Cycles, Ambient Temp Range -30 Deg C to +40 Deg C, Operating Duty Cycle 0-0.3 Sec CO-15 sec –C0. (5) 2016 GE Type OTCF-145EM Capacitor Voltage Transformers w/ 145kV Max System Voltage, 80500V Rated Primary Voltage, CN 18800pF, C1 22170pF, C2 132800pF. (21) 2016 Cleaveland / Price LCO-C 34.5/2000 Single Pole Disconnection Switches 34.5kV / 2000 Amp. (15) 2016 Cleaveland / Price LCO-C 14.4/2000 Single Pole Disconnection Switches 14.4kV / 2000 Amp. 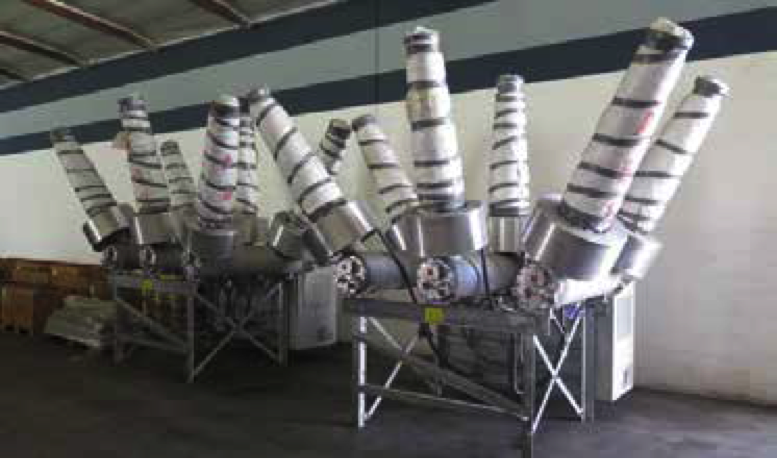 (12) Southern State Type EV Breakers 145kV Max, BIL 650kV Amp Continuous 1200 Amp Short-Time 38000 Dur.3S Peak 49000. (10) Mdl. 650 EU 650kV-4100 lb Insulators. (4) Mdl. 650 HU TR-289 650kV-2200 lb-U Insulators. (2) 2016 Alcad mdl. Q120035ZL514AA EnerGenius IQ Dual Microprocessor DC Power Supply / Filtered Battery Charger with Integrated Battery Check System and Data Logger 208/230-240 60Hz Input, 120VDC Output. (2) 2016 Alcad mdl. Q120035ZL514LA EnerGenius IQ Dual Microprocessor DC Power Supply / Filtered Battery Charger with Integrated Battery Check System and Data Logger 208/230-240 60Hz Input, 120VDC Output. (2) GE Zenith “ZTS” 40-4000 Amp Transfer Switches w/ Entelli-Switch 250 Digital Controller. (2) Siemens Substation RTU Panels w/ S.M.2 Base Card, 48VDC Power Supply, PCB REL OUT CNTRL FW:1016103000SBO, PCB Relay Termination (MOM)PRD3, PCB DIGIN CNTRL FW:1016077000, PCB DIG INPUT TERM, PCB ANALOG INPUT CNTR. Schweitzer Engineering Laboratories (2)mdl. SEL-3355 2.5GHz Dual Core Computers w/ Tyco 17” Touch Screen Monitors, Keyboard Rack Mount, (2)mdl. SEL-587Z High-Impedance Differential Relays, (4)mdl. SEL-387A Current Differential Relays, (2)mdl. RTAC SEL-3530 Real Time Automation Controllers, (2)mdl. (2)mdl. SEL-2407 Satellite Synchronized Clocks, (5)mdl. SEL-351A Protection Systems, (2)mdl. SEL-735 Power Quality and Revenue Meters, mdl. SEL-2812 Fiber-Optic Transceivers w/ IRIG-B. (2) ERL “TESLA 4000” Power System Recorders, (9)mdl. 110739 AC 4 Channel Isolated Current Input Modules, (4)mdl. 401006 AC 3 Channel Isolated Voltage Input Modules. (6) Eaton 400A 240V 60Hz 250V Heavy Duty Safety Switches (Breaker Boxes). (2) GE mdl. 460XEID Lighting Contactor Switch Boxes. ElectroSwitch Corp (8)mdl. 78PB10E, (6)mdl. 24PA202PW, (7) mdl. 24PD38D Rotary Switches.